You’ve just purchased a lovingly hand-crafted chess board or a set of dominoes made of exotic wood. What have you actually bought? The materials, of course. Soft leather or beautiful marble or carefully selected woods. You are also paying for the artistry of the designer or the skills of the craftsman. A lifetime of working with a particular material or a moment of brilliance that creates something truly unique and stylish. These are the physical qualities that set one version of a board game apart from another; these are what your guests notice as they walk into your home and see your chess pieces proudly displayed; these are what your opponent admires as he battles you on your perfectly quiet and functional backgammon board. But there is another value added in there that is hard to pin down. Strangely, we are also buying the rules for the game. What do I mean by this? Let’s return to the premium chess set. Whether you purchase the set because of your passion for the game or because you admire the look of the board with all the pieces in their starting position, you are buying the set, in part, because of the rules that govern how those pieces move. After all, a chess set is not just a collection of colors, materials, and carvings. Chess is a game with a long history and with connections to genius, strategy, and creative thinking. If the rules for chess did not exist, would we be so eager to purchase beautiful little statues or a square piece of marble with alternating colors? One does not even have to actually play with their chess set to find value in the rules and history of the game. The value of the rules is inherent in the set. Ask yourself if it would be worth quite as much to you if the exact same materials were transformed into an equally beautiful set of pieces that had no rules or notable history. Although no one person added this value to the game or profits from it, we all evaluate the pieces differently because we share this universal set of rules about what a chess set is for and what it means. With this idea in mind, I’d like to look at a very simple game – dominoes. Unlike chess, there is a little more leeway in what is included in a set of dominoes. Namely, the number of dominoes can differ from set to set. Imagine if there were different versions of chess, each with a different number of pawns! Dominoes, like chess pieces, can be made from a variety of materials and with an unlimited potential for design flourishes. Yet, part of what is valuable about a set of dominoes is the sheer number of games that can be played with them. With the same set of numbered tiles a variety of games are available, each with their own history and strategy. One of the most familiar forms of dominoes is a simple blocking game in which the goal is to play all your tiles before your opponent plays hers. In such a game your focus is on playing your dominoes in the order that will allow you to always have another move available. Playing with a Double 6 set you can usually look at the board and guess or know what your opponent holds, allowing you the option of blocking her next move. Since scores are determined by the number of pips left in your hand at the end you also need to think of ways to play your highest tiles quickly. In a scoring game of dominoes, however, you will follow the same basic actions (placing dominoes so their ends match the tile on the table) but now with a completely new strategy. A popular British version of the game scores for multiples of five or three. In such a game the double 6 domino is no more valuable or dangerous than a double 1 – it all depends on what other tiles have been played. In other versions of dominoes you might not be able to block your opponent or you might need to focus on collecting groups of the same family to play together. Whether or not the rules allow you to play the tiles side-to-side rather than end-to-end also drastically changes the game. 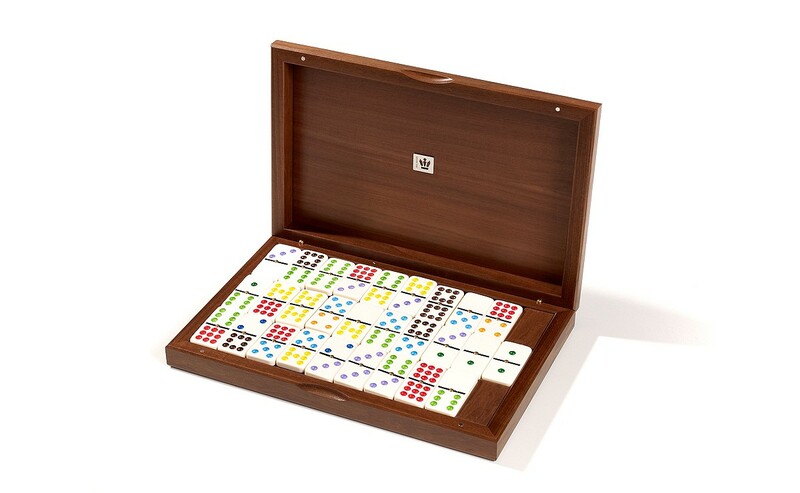 So the next set of dominoes you purchase will not only contain choice tiles and a beautiful box, but centuries of history and millions of hours of creative thinking by people all over the world who spread the popularity of the game and created their own versions to play. And this is part of what I love about games. You can customize them and make them your own, but a deck of playing cards or a pair of dice are also communal objects that we have given meaning to as a society.